The new plan calls for schools to be joined. When classes begin in September, there'll be fewer elementary schools, but better conditions for pupil, according to a plan to improve the education system in Armenia. Some 37 schools will be consolidated, closing some schools that are in chronic disrepair and/or poorly attended. 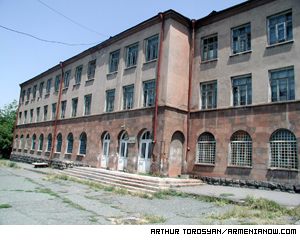 Yerevan's Sundukyan School No. 26, for example, hasn't been repaired in more than 50 years officials say. It will be closed, and its students sent to School No. 124. The decision to consolidate schools provoked a protest demonstration from staff of several schools, but authorities say the merge is a suitable solution. Onik Vatyan, head of the Education Department of the Yerevan municipality, says it would be irresponsible to continue classes in such poor facilities. "Even if the parents agree that their children study in those damp classrooms that are swarming with insects," Vatyan says. "We can not neglect this." Further, in some large schools, enrollment has decreased, leaving buildings that are only partially used. The head of the department of general education of the Ministry of Education and Science, Norayr Ghukasyan says it is extravagant to have two schools meant for 1,000 pupils where only 100 attend. 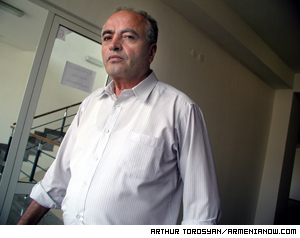 Manukyan says some teachers will be dismissed. "The government allocates several millions on communal expenditures of the schools that are less loaded than they are meant to be," says father of two students, Henrik Alaverdyan. "This is a waste the bigger part of which goes into the pocket of the headmaster. This is the case when we have inherited many schools from the Soviet times, when every district has more then 10 schools that can be used more rationally." The shift will no doubt create some inconvenience (School 124, for example, is not near to the homes of children who've attended No. 26), but officials say the consolidation will reduce expenses and provide funds to increase teacher salaries. The number of teachers, however, will be decreased. By some international standards, one teacher is sufficient for every 20 elementary pupils. In Armenia, however, the current ratio is one to 10. According to Department of Education representative Sasha Kubanyan, some teachers are teaching only one class, earning only 3,000 drams (about $5) a month merely as a means of keeping their seniority. "It is obvious that getting such a miserable salary, a teacher will not make an effort to teach his students," Kubanyan says. Such conditions encourage some teachers to turn to taking bribes, she says. Ultimately, the optimizing program will dismiss excess teachers, while increasing salaries for the necessary ones. At present, the average teacher salary is 13,000 drams (about $22). It is hoped that, by 2006, salaries will increase by more than double, to 55,000 drams (about $96). Large schools that have been mostly empty will be consolidated with others. "It is difficult to say how many teachers will be dismissed as the process has just started," syas Nurijan Manukyan, head of the supervising department at the Ministry of Education and Science. "We can say for sure that the headmasters, heads of the teaching/curriculum departments and stewards of the joining schools will be dismissed. But in regard to the number of the teachers that are to be dismissed we cannot say anything definite." Teachers older than 60 will be dismissed or retired, concurrent with an increase in pupil to teacher density and an increase in class load. "Today teachers older than 70 that can hardly go up the stairs to work in the school," Kubanyan says. "How can they possibly keep the students in a mood to study or organize excursions?" 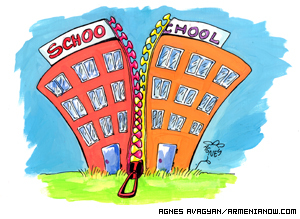 In total, there are 1,392 schools in Armenia. Fifty-three are boarding schools, 35 art schools and 1304 for general education. The total number of teachers is 55,000 and there are 530,000 students.